After plenty of winter rain, the hills of the Yolo Land and Cattle Company are especially green this year. That’s a good thing, says owner Casey Stone, when you’re raising grass-fed cattle. “We’ve become more grass farmers than cow farmers. You gotta manage the whole resource and whole package,” says Stone. Stone and I are driving through his 7500-acre ranch in Yolo County, about 30 miles west of Sacramento. “These are some of our fall calvers out here,” he says, pointing to just a few of his 700 Black Angus cattle, who, right now have fuzzy winter coats. “There have only been a few families that have owned this ranch over the years since it was homesteaded back in the 1860s,” he says. Stone’s father started their cattle operation in the 1970s and he took advantage of the Williamson Act. Here’s how it works: in exchange for agreeing not to develop their land, the Stones pay lower property taxes on their ranch. The program was created in 1965 to preserve open space in California. Today, it covers more than half of the state’s farm and ranchland. Under Governor Jerry Brown’s proposed budget, state funding for the Williamson Act would be eliminated. “I think people have taken it for granted up until recently cause it’s always been something that’s out there,” says Stone. Counties will also be in a tight spot, if the legislature passes Brown’s budget. Since counties collect lower property taxes under the program, the state usually reimburses them for the lost funds. In Yolo County, that’s supposed to be 1.3 million dollars a year. Of course, these days, all of California is facing some tough cuts, as Governor Brown said a few weeks ago. “Do I like the choices we face? No, I don’t like them. But after serious study of the options left by a 25 billion dollar deficit, the budget I proposed is the best that I can devise,” he said in the State of the State address. But the Williamson Act isn’t just something that ranchers care about. On Howard Ranch, a 12,000-acre cattle ranch in eastern Sacramento County, Jaymee Marty is standing next to what looks like a small pond. Marty is an ecologist with the Nature Conservancy. “A vernal pool is basically a season wetland and this is sort of a little hotspot of native diversity,” she says. These small wetlands may not seem like much, but every spring, they only appear in California’s grasslands. By summer, they’re completely dried up. “So you have you know hundreds of plant species that are found nowhere else in the world except in California in vernal pools.” They’re also home to species like ferry shrimp and tiger salamanders. 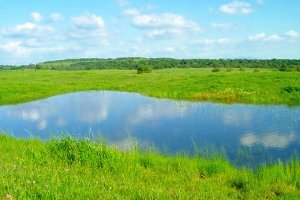 Two different vernal pools in Jaymee Marty’s research. On the left is a pool that’s been fenced off from cattle, while the pool on the right was left open. The fenced pool is choked with thatch and invasive weeds like Medusahead. Cattle have kept those plants down in the open pool, which Marty says is a more productive environment for tiger salamanders and other species that depend on these seasonal pools. Photos: Jaymee Marty and Jennifer Buck. Instead, Marty found that cattle help create a better environment for vernal pools. There are types of grazing that are not good for the ecosystem, says Marty, but studies have shown that rangeland is an important habitat for raptors and other wildlife. That’s why she sees the Williamson Act as an important conservation tool in California. But in Sacramento, the act is competing with schools and health care for limited funding. Legislators are now holding budget hearings that will decide the future of the program.